Project Rain Garden will aid in the installation of 12 residential rain gardens within the City of Petoskey as a means to increase community awareness about stormwater and to protect the water quality of Little Traverse Bay. A rain garden is a planted depression that receives and absorbs rain and snowmelt runoff, also known as stormwater, from impervious surfaces like roofs, driveways, walkways, parking lots, and compacted lawn areas. 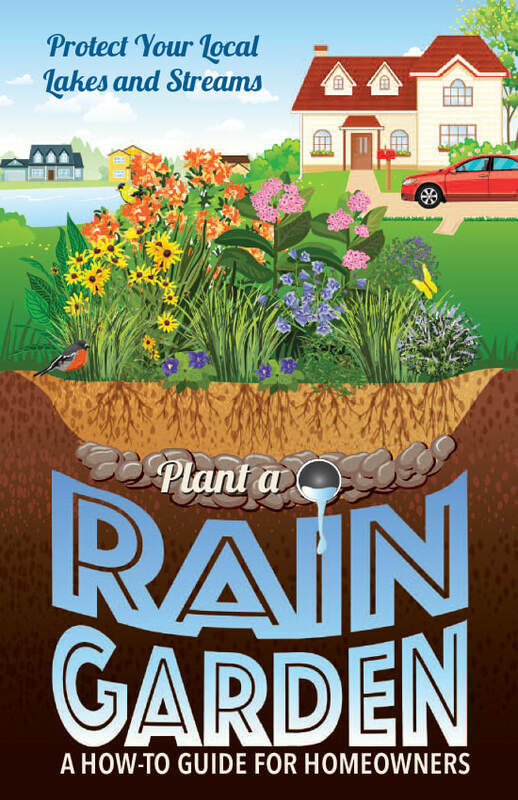 Rain gardens help filter out pollutants such as lawn fertilizers and pesticides, oil and other fluids from cars and machinery, and debris and litter. Rain gardens are designed to fill with a few inches of water after a storm and the water slowly filters into the ground rather than running off to a storm drain. Once stormwater enters the city’s stormwater sewer system, it is piped to Little Traverse Bay and the Bear River, pollutants and all. Pollutants that end up in the Bay or the River can affect water quality, aquatic habitat, recreation, and public safety. Project Rain Garden is a cost-share program that helps offset costs associated with the installation of new residential rain gardens. The Project will cover up to 40% or $1500, whichever is lower, toward each rain garden. In total, twelve residential rain gardens within the City of Petoskey limits will receive assistance. A rain garden that is funded by this will help others learn about rain gardens and encourage people to create their own rain garden. Therefore, grant recipients must agree to following educational efforts. Photo document your rain garden at various stages that may include before, during, and immediately after installation, as well as subsequent years to monitor its progress. Allow the rain garden details and photos to be published on Tip of the Mitt Watershed Council’s website (www.watershedcouncil.org), Facebook, or other publications. Place a Protecting Little Traverse Bay, One Rain Garden at a Time sign in the rain garden as provided by the Watershed Council. Applications will be reviewed and awards will be made as they are received. A review of the submitted residential rain garden application. A site visit to determine if the proposed location is suitable for a rain garden. For those sites deemed appropriate, the Watershed Council will provide an agreement form outlining the conditions of the award. Once the agreement form is returned, complete with the property owner’s signature, the Watershed Council will notify you with the counter-signed agreement and project coordination may begin. NOTE: Applications are reviewed and awarded as they are received. 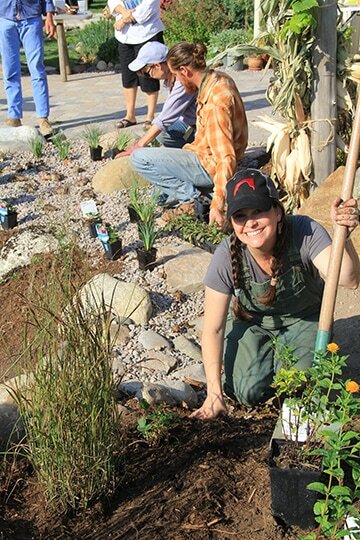 Funds are only available for 12 rain garden projects. The proposed project is within Petoskey’s city limits and will be located on a residential parcel. Applications from individuals other than the property owner will be accepted IF they have the written permission of the property owner to apply. The rain garden is designed and constructed in a way that will reduce stormwater runoff and improve water quality. Michigan native plants and their cultivars are the dominant vegetation used in the rain garden. Under no circumstances will invasive plant species allowed. Refer to: www.habitatmatters.org/uploads/9/5/0/6/95066352/invasive_ornamental_plants_gbb_update.pdf for a list of prohibited species. This cost - share program will reimburse 40% of project expenses up to a maximum of $1,500. Do not start construction of your project until receipt of a counter-signed agreement from Tip of the Mitt Watershed Council. COST SHARE FUNDING IS A REIMBURSEMENT for documented costs occurring AFTER the notification of grant award. After all program requirements have been met and approved, including a site visit to verify project completion and success, a request for reimbursement may be made. Reimbursement requests are typically processed within 30 days of receipt. Costs incurred before the project was approved will not be reimbursed. For additional information or questions, please contact Jen Buchanan at 231-347-1181. Project Rain Garden is made possible with support from the Petoskey-Harbor Springs Area Community Foundation’s Little Traverse Bay Protection and Restoration Fund.